OBITUARY: Roy Young played with The Beatles but turned down chance to join Fab Four . Beatles Radio: The Beatles, Solos, Covers, Birthdays, News The Fab 4 and More! ROY Young, who has died aged 83, was a rock n' roll star who played with David Bowie and The Beatles but turned down the chance to join the Fab Four. Roy Frederick Young was born on October 20, 1934, in the London borough of Tower Hamlets. He was evacuated to Oxford at the start of the Second World War, and his family would eventually settle there. His mother Lily was a well-known pub pianist in the city and he played the piano from the age of eight. When he left South Oxford School in St Aldate's he began performing around Oxford, most frequently at the Carpenters Arms in Cowley. After serving in the Merchant Navy, where he travelled the world and performed many shows for crews and passengers, he auditioned for the TV pop show Oh Boy! in 1958. His rendition of the Little Richard hit Long Tall Sally led producer Jack Good to make him a regular on the BBC Saturday teatime show and its ITV rival Drumbeat. The following year he recorded his first single Just Keep It Up / Big Fat Mama - thought to be a tribute to his mother. 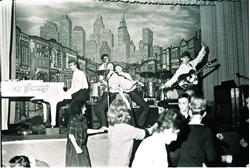 After several more singles recorded for Fontana Records he began extensive tours with Cliff Richard and The Shadows, playing clubs, theatres, variety shows and cabaret dinner clubs all over the country.